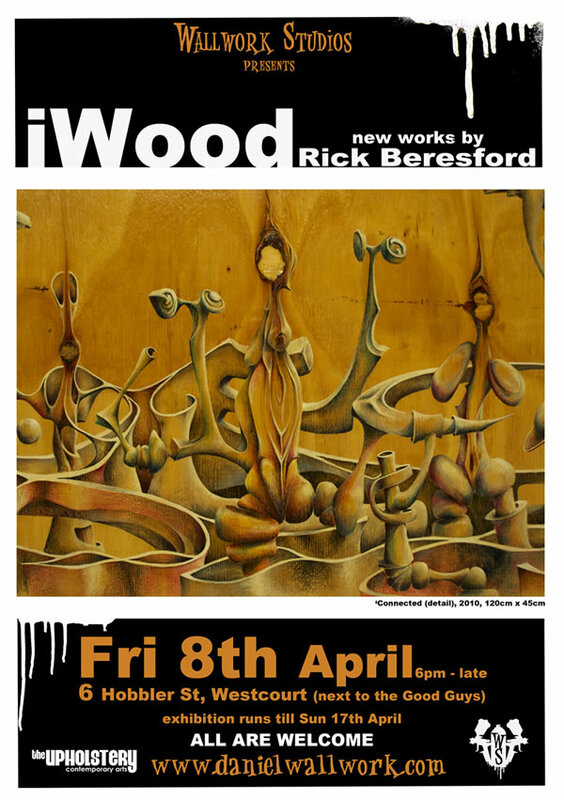 iWood, Ricks first solo exhibition, is a stunning exploration of the use of natural wood grains and knots as a catalyst for creating surreal landscapes and abstract patterning. Beginning with no pre conceived beginnings other than the surface itself, his highly evocative works are often reminiscent of other worldly cityscapes that have been merged, twisted and hybridized with feminine forms and layered with sexual undertones. The exhibition featured many new works, including drawings, paintings and a limited edition series of lino prints and etchings. Rick is currently completing his Honours at James Cook University in Creative Industries, is also a school teacher at the Yarrabah Secondary School Campus and is one of the emerging artists selected to create public artworks for Cairns Regional Councils ‘Changing Lanes’ festival, which was opened in May 2011.